The Sirens of Falkeld by Julie Tuovi is set in war torn Scotland. We follow Kade Finley nine years after his father dies. His Gaffer is sick and to save him Kade needs a mermaid's magic. Captured while on the restricted beach, Kade must help the Admiral Gilbert Owen before he can continue his quest to save his Gaffer. In this tale, mermaids are not beautiful, peaceful creatures, but soul-sucking, evil beings. Never trust a maighdean mhara. 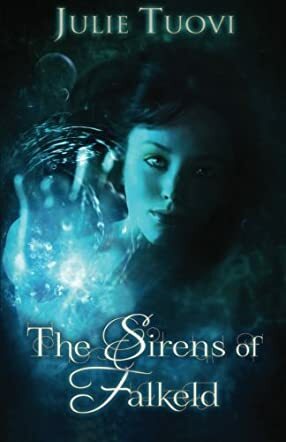 The Sirens of Falkeld by Julie Tuovi was not what I was expecting, but in a good way. I thought I was getting a mermaid story and things were going to be lovely and peaceful, but I was proven wrong. Kade's back story is very interesting. The story gives us a rich history of the area and the legends the locals believe in. When going anywhere, we are given a full, detailed description, helping us feel we are there. The chapters rotate between Kade and Cora, but not in a confusing manner. I normally do not root for the bad guys, but by the end of this I was siding with the mermaids and the ending had me on the edge of my seat. I fell in love with all the characters and with the story. The story gripped me from page one and, even after it is done, I cannot stop thinking about it. The story drags you into a world of magic, legend, and death, and you will not be able to put down this beautifully written tale.